Cinderella star Lily James says criticism about her waist being made to appear too thin in the movie is “irrelevant”. Disney’s live action adaptation has faced a backlash from parents who claim the character has an unnaturally small waist. 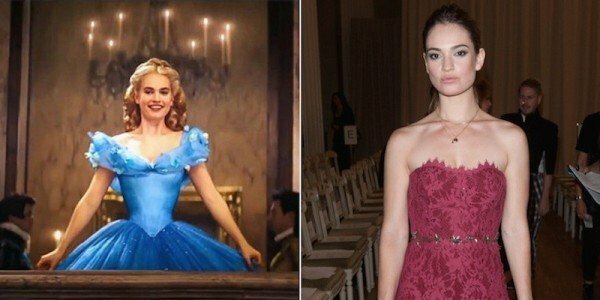 Lily James, 25, reportedly had to go on a liquid diet to fit into the tight-fitting corset for the role. “Why on earth are we focusing on something so irrelevant?” the actress asked reporters at the UK premiere. “I’ve had friends’ kids and a little boy Daniel who is nine and he said, <<It’s amazing how you promised your mum to be kind and good and remembered it>>. The movie has been criticized ever since a trailer showed Lily James in a blue princess ball gown with a tiny waist. Some people accused filmmakers of digitally resizing it to make it look smaller, but the stars denied that at the premiere. Other critics say Cinderella is an unhealthy female role model and that it’s undone some of the work of Frozen because it suggests she needs Prince Charming to get by. Game of Thrones actor Richard Madden, who plays the role, says that’s nonsense. Cinderella also stars Cate Blanchett as Lady Tremaine, Stellan Skarsgard as the grand duke and Derek Jacobi as the king. Infographic: What Writing Techniques Did Famous Writers Use?